The Drink Me potion lingers on the tongue, the mango nectar strong and sweet. Ensconced in a dark-tinted glass apothecary bottle with a mini straw and a Drink Me label, this is one difficult beverage to ignore. Surrounding the bottle are various cakes and scones, a tea fit for a king or a little blond girl who followed a rabbit down a hole. The Mad Hatter’s Afternoon Tea lets you experience what Alice did in that long ago-written novel full of mysterious potions and foods. However, here each of your treats will be explained to you. 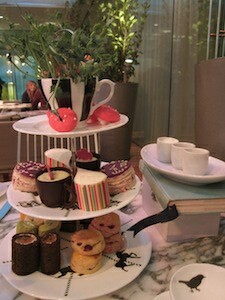 Inside the Sanderson Hotel on Oxford Street is an enclosed patio where the Mad Hatter’s Afternoon Tea begins. When you arrive at your pre-booked time, you will be led into the patio courtyard. White wicker chairs and marble tables are the setting for your afternoon in Wonderland. The rushing fountain and twisted trees surround you, drawing you further into the story. Here, your personal trip down the rabbit hole starts when you are seated at your table. Everything from the setting to the dishes pays homage to the novel. 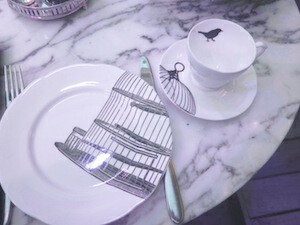 The white plates set before you are adorned with simplistic sketches of birdcages and oddly-shaped clocks. These form a pattern with the saucers and tea cups. 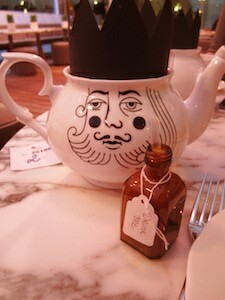 When the tea arrives, the cartoon face of a king or queen stares at you from the pot, and a paper crown sits atop the vessel to complete the image. Of course, the tea arrives with many treats as well. The sweet treats remind you of the novel and garden themes. Besides the Drink Me potion, there is a chocolate tea cup filled with a mousse made from green tea and a white chocolate flower. For the rabbit that Alice followed, there are carrots made from carrot puree and meringue tucked in a pot with pea shoots. Don’t forget the mushrooms, made of a strawberry and cream meringue. The melting rainbow cheesecake is not to be missed, with the smooth teardrop slice enclosed in a rainbow white chocolate layer with a mango surprise inside. These are only a few of the sweets on offer. The savory treats are just as tasty, from scones of the day to tea sandwiches. The sandwiches are not merely simple toppings on bread. They include rolls of rye bread stuffed with salmon and cream cheese, and watercress and lemongrass stuffed in spinach rolls. The scone and quiche options change daily. You could find a scone of cranberries baked with tangy goat cheese. The quiche could be a nutty pumpkin mixed smoothly in with fluffy eggs. If one is not enough of these sandwiches, simply ask for another of your favorite sandwich options. The Mad Hatter’s Afternoon Tea occurs every day from 12:30 p.m.-5:30 p.m. It is located in the Sanderson Hotel on Oxford Street in London. The price runs from £38-£58 ($64-$97) per person depending on the purchase of alcohol. Children from ages 4 through 11 are £30 ($50). Reservations are strongly recommended.